In “Greater New York” at MoMA PS1, Gedi Sibony, known for his early assemblages of carpet and drywall, is represented by nine framed pieces that were made in 2015, but borrow an idea from his previous work. Each piece, seemingly sourced in a thrift shop, consists of an old metal frame — the popular, make-it-yourself modular type used to frame posters and prints in the 1970s. 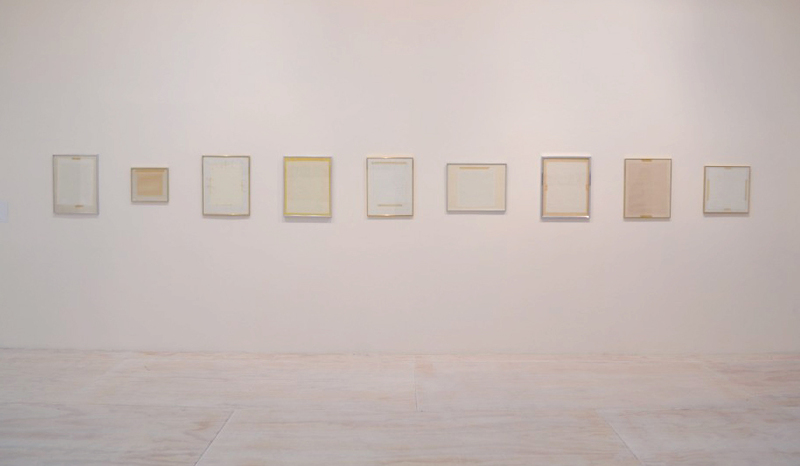 In each, the artwork has been turned away from the glass, leaving a view of the back where an anonymous framer attached the fragile piece of paper to the matboard. By displaying the back of the artwork, rather than the images that the original owner framed, Sibony playfully challenges the viewer to embrace a new narrative. The disintegrated tape and the yellowed matboards may at first glance seem a simple riff on Robert-Ryman-esque Minimalism, but they also tell a another story — about time, decay, and changing aesthetics. 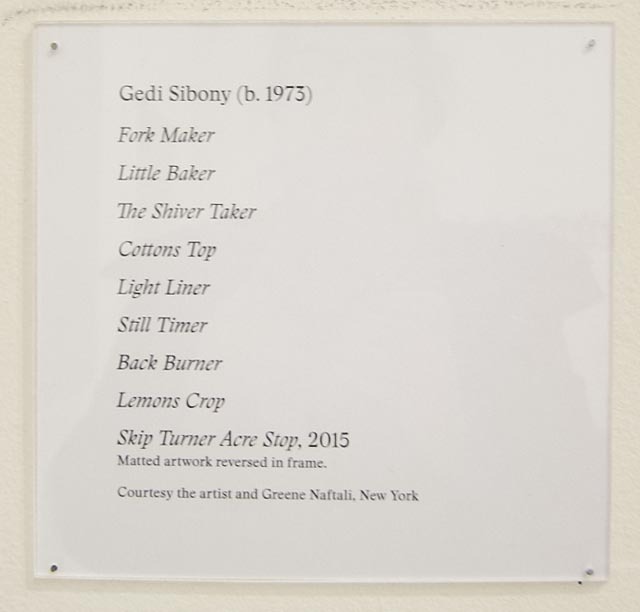 Gedi Sibony, label in “Greater New York.” Perhaps these are the titles for the artwork that has been turned to the wall? “Greater New York,” curated by Peter Eleey and Mia Locks of P.S. 1; Thomas J. Lax, associate curator of media and performance art at MoMA; and Douglas Crimp, a professor of art history at the University of Rochester. MoMA PS1, Long Island City, Queens, NY. Through March 7, 2015. Oh please! Hasn't this effort been seen enough? Appropriation needs to inform or create a dialogue to move forward not just take the ordinary and make it even more ordinary.